For a lot of you, the season of over-eating and stuffing yourselves silly has come to an end (indeed it did, the moment the clock ticked over to 1st of January 2012). But for us (the Boy and I) and majority of the Chinese population around the world, Christmas and New Years was just a precursor of what’s to come. You see, Chinese New Year (a.k.a. Lunar New Year or Spring Festival) falls on the 23rd of January this year. It is a time of celebration, and a time of constant feasting. For a full 15 days. The days before the first day of Chinese New Year is usually a time where families gather together in one household to host their reunion dinners. It’s for brothers, sisters, in-laws, cousins, nephews, nieces, uncles, aunties to gather under one house (usually grandparents, if you are lucky enough) for a full multi-course meal. This year, the Boy and I will be returning home to Malaysia to celebrate our last Chinese New Year as ‘singles’ before we get hitched later in the year. It’s a very important and special journey for us. It is a Chinese tradition for non-married individuals to receive a token of prosperity in the form of red packets (hong pao [Mandarin], lai see [Cantonese], ang pow [Hokkien]) filled with cash from anyone else that is in happy matrimony. So, this will be our last year to cash up and finally be grown ups in the traditional sense. We thought it would be appropriate to share with you a recipe to serve up to your families this year. Add tamarind paste into water and mix to dissolve. Mix in coriander powder, onion powder, maltose, sugar, salt, pepper and thick dark soy sauce with the tamarind water to form a marinade mixture (it’s not a big issue if the maltose doesn’t mix well). 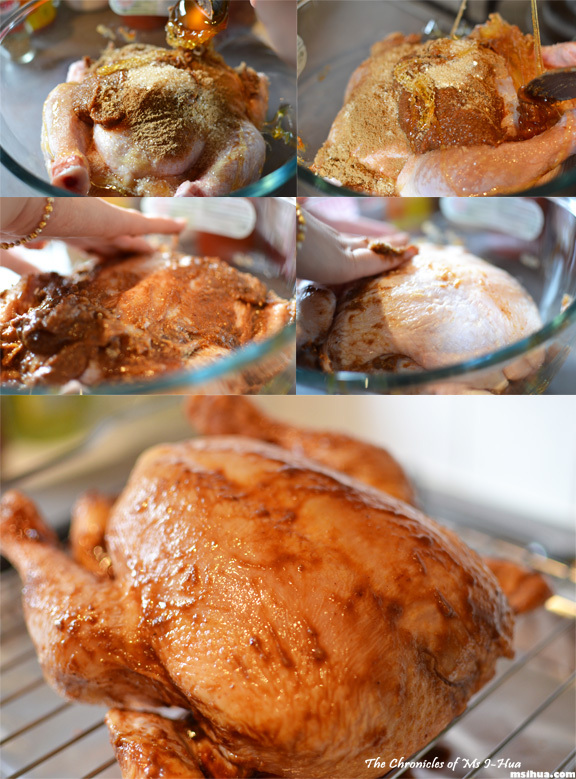 Rub marinade all over chicken (use your hands to spread the maltose out). Rub marinade all over the cavity as well. Place chicken (covered in a bowl) in the refrigerator overnight. Take chicken out and let stand on roasting rack until it reaches room temperature. Preheat oven to 220 degrees Celsius. Remove any excess marinade (the gluggy bits) from the chicken. Keep the excess marinade and any excess liquid from the bowl. 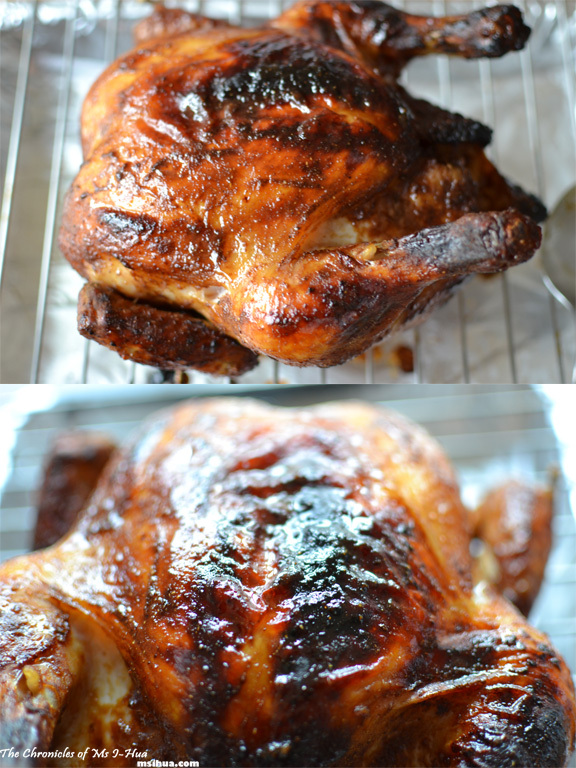 Place chicken in the oven (breast-side up) and roast for 25 minutes. Reduce temperature to 200 degrees Celsius and roast for another 30 minutes. Careful not to let your chicken burn, reduce temperature if so. Check the chicken by skewering it under the breast (where the thigh meets the breast). If juices run clear, then your chicken is ready. Remove chicken from the oven and let it rest on the rack for 10 – 15 minutes. Skim the fat from the pan dripping. Add the dripping with the leftover marinade and excess liquid kept from earlier. Cook until it turns to a slightly thick sauce-like consistency (you can opt for a jam-like consistency as well but I prefer it to be more liquid). Carve chicken into desired number of pieces. Serve with rice and sauce. What is your traditional reunion dinner feast (if you have one) and what is your favourite dish? Thank you for sharing this lovely recipe! 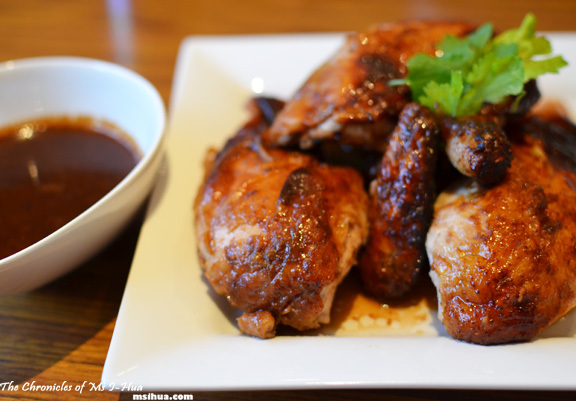 Coincidentally, I’m preparing Ayam Sioh for the first time for our party tonite, and am looking for more ideas on how to prepare it 🙂 The roasted version looks really great…. 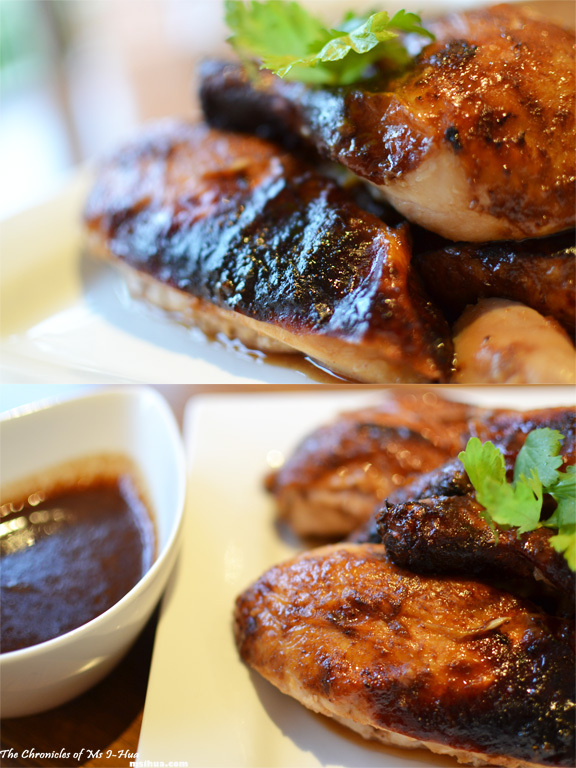 Lorraine @ Not Quite Nigella recently posted…Win a $150 Gourmet Meat Voucher at Brookvale Meats! I’d drink and gamble for money. And I’d be very good at eating lots of dessert to deflect from avoiding the meats. Yay for a tamarind sauce recipe! I used it for the first time in a vegie dish the other day and was going to try and find other recipes that used it… merci beaucoup :). Hello there fellow food blogger 🙂 I do hopw you have a lovely CNY too 🙂 Thanks so much for your lovely words! Maltose is a type of sugar. It is very very sticky. You should be able to pick it up from most grocery shops. They sell it in jars. Or you could try online? Our reunion dinner feast is a Jamie Oliver recipe of roasted shoulder of lamb with smashed root veg and greens. Absolutely delicious! That sounds absolutely smashing! Yum!! Ah, I’ve done a bit of googling and I think I can get Maltose from the chinese supermarket here in Bristol. Would honey, maple syrup or golden syrup be good substitutes if I can’t get hold of it? Are there subs for maltose? I’m based in London. We get our maltose from any of our grocery shops here in Australia, so I’m guessing you can find it pretty easily in the baking aisle too or at an Asian grocery. A possible sub for it would be brown sugar?